This was going to be a review of natural toothpastes but one of the toothpastes is not natural as I first thought and probably the reason I liked it best since it seemed more like regular toothpaste than the others. So I've changed this to a sugar free and natural toothpaste review and will continue to update as I try different brands. Most toothpastes contain toxic chemicals like sulfates, petroleum dyes and artificial flavors and sweeteners. 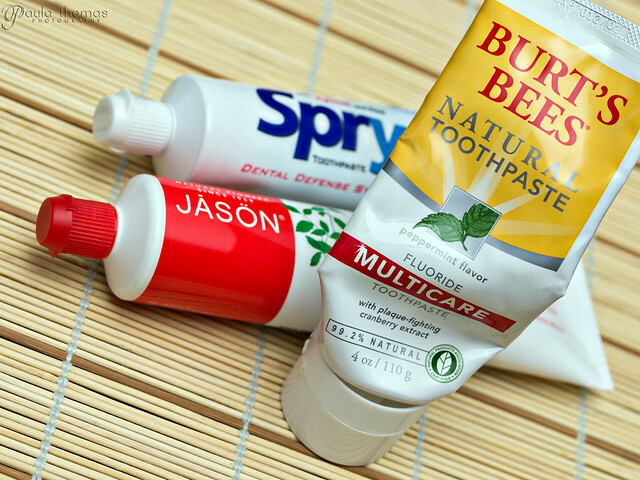 I have been trying different mostly natural toothpastes to find one that I like the best. Some toothpastes also have the option of fluoride or not. I was getting fluoride at first until I read how that too can be harmful so I have avoided it with my last couple tubes of toothpaste. There are reports that show an increase risk of bone cancer and other diseases and health issues related to fluoride. Here's one good article I came across about the subject: http://www.viewzone.com/fluoride.html The last couple times I've gone to the dentist they haven't given me fluoride treatments like they used to and I didn't bother to ask why. I figured they just forgot cuz I never liked getting them anyway. Now if they try to give me one I will request they don't. ** Tom's of Maine (clean & gentle) - Most of the Tom's of Maine toothpastes contain SLS. The Clean & Gentle one doesn't. Be sure to always read the ingredient listings of things you buy. Even if it's something you've bought before. Companies have been known to change their recipes. This one seemed to have pretty good reviews but it was my least favorite. I'm used to having a tooth paste that has some body but it just got flat when brushing with it. It was like brushing with water. The taste wasn't bad though. *** Burt's Bees (Multicare Peppermint) - This one was a little better than Tom's. My problem with this one is that it was messy. Every time you put it on your brush it leaves a stringy trail of toothpaste when you pull away from the brush. The taste was good though and it provided good body during brushing. Also it seemed like the there wasn't a lot of toothpaste in the tube, it ran out faster than I thought it should. Burt's claims to be 99.2% natural so it isn't 100%. *** Jason (Powerful Peppermint) - The texture of this one is similar to Burt's Bees and it's hard to spread on a toothbrush. The tip of the tube is small unlike the Burt's Bees so this one is easier to keep the tip clean. There is a bit of a weird slimy kind of texture coating my teeth and tongue after using it. **** Spry (Cool Mint) - It has pretty good body, the taste is good and it easily spreads on a toothbrush without making a mess. I didn't have any complaints with this one other than it not being natural like the others. It contains several chemicals that most likely aren't good for you. However it doesn't contain Sodium Lauryl Sulfate (SLS) and Sodium Laureth Sulfate like so many others do. But it does contain the following: Sodium Methyl Cocoyl Taurate, Sodium Lauroyl Sarcosinate, Calcium Glycerophosphate, Calcium Lactate Gluconate, Carum Petroselinate, Sodium Benzoate and Titanium Dioxide. So if you're trying to avoid possible harmful chemicals this probably wouldn't be a good choice. **** Kiss My Face (Triple Action) - This one is probably the best tasting one of those I've tried. The lather is better than most of the natural toothpastes too. However, it does contain Xylitol, an artificial sweetener and quite a few additional ingredients I've never heard of. ** Tea Tree Therapy (Whitening) - I didn't care for this one much at all. The lather was not good and neither was the taste. ***** Nature's Gate (Anise) - This one is my favorite so far. It has great lather. However the taste of the anise takes a little bit of getting used to. They do have other flavors so will be trying the mint one too. I tried the paste but they also have 4 flavors of gel. It contains baking soda which is great for getting your teeth clean. The flavor is strong enough that you can't really taste or smell the baking soda. EDIT: I've given the mint gel a try and I do like the mint flavor better than the anise but I prefer the paste. The gel is harder to get out of the tube, it's very thick and doesn't seem to lather up as well. **** Desert Essence (Fennel) - This one has baking soda in it and you can tell by the smell when you brush your teeth. Baking soda is great for cleaning your teeth and some people only clean their teeth with it. The lather is very good and it is also available in ginger, mint and wintergreen. The fennel wasn't too bad but I'd probably like a more traditional mint flavored toothpaste. **** auromere (Licorice) - This one uses fine chalk to gently cleanse your teeth rather than the baking soda that most natural toothpastes have. The texture is nice but I'm not sold on the licorice flavor. The licorice flavor is not SLS free but they do make an SLS free cardamon-fennel that I would love to try. There's also a mint flavored one which is my preferred flavor for toothpaste. The color is a little off-putting, a light brownish tan color. * Himalayan (Neem & Pomegranate) - This toothpaste had a different consistency than any of the others. It was very soft, like a thick lotion. Even a little water pressure makes a dent in the toothpaste. It doesn't seem to contain any abrasive things like baking soda or chalk even though my teeth felt pretty clean maybe even more clean than other toothpastes. However there is one big red flag. Every time I use it I get the smell of cigarettes/nicotine. After a few weeks of using it I finally decided to do a google search to see if I was crazy. Sure enough there is an article that claims several toothpastes were tested to contain nicotine and Himalayan was one of them even though they say that they don't. So be aware. I do not want to brush my teeth with nicotine so I will not be buying this brand again. **** Earthpaste (Wintergreen) - This is about as natural of a toothpaste you will find. If you've ever looked at the ingredients of toothpaste there is usually a laundry list of them but this one only has 7 (purified water, food grade Redmond Clay, Xylitol, Wintergreen Essential Oil, Menthol, Redmond Real Salt and tea tree oil. They claim that the toothpaste is so natural that it is safe to eat. It says "Rinse or swallow at your discretion - either would be fine". Seems like the perfect toothpaste for camping! I however have chosen to not swallow it because it just seems wrong. The taste is great but the bad news is there is pretty much no lather so if you like a lot of lather you're not going to like this toothpaste. It doesn't bother me much because my teeth still feel clean after using it and it has a nice minty flavor. It comes out of the tube from a very small hole compared to other toothpastes which is a little weird but it seems to stay on the brush well and the top stays clean. It's also a brown color which I don't mind. I'd rather have brown toothpaste than have it artificially colored white. It's also available in cinnamon, lemon and peppermint. Thanks for your Sugar Free and Natural Toothpaste Reviews. My current toothpaste not working good. So, i want to different products like this. I hope it's make bright smile:). Thanks for sharing. Thank you very much for collecting !! Thank you! I'm searching for information after brushing with Crest, which I've used all my life, but they have changed their formulas over the years, and I just bought "Pro-health" (haha) "whitening, fresh clean mint". It tastes VERY sweet and in the morning when I wake up my whole mouth feels like I coated my mouth with something sickeningly sweet, like icing from a cake. Gross!